There's an expression in the "hamosphere" that "Life's Too Short for QRP," or low-power operating. The authors of the nine different articles on various aspects of low-power operating in this year's QRP Special would certainly disagree. 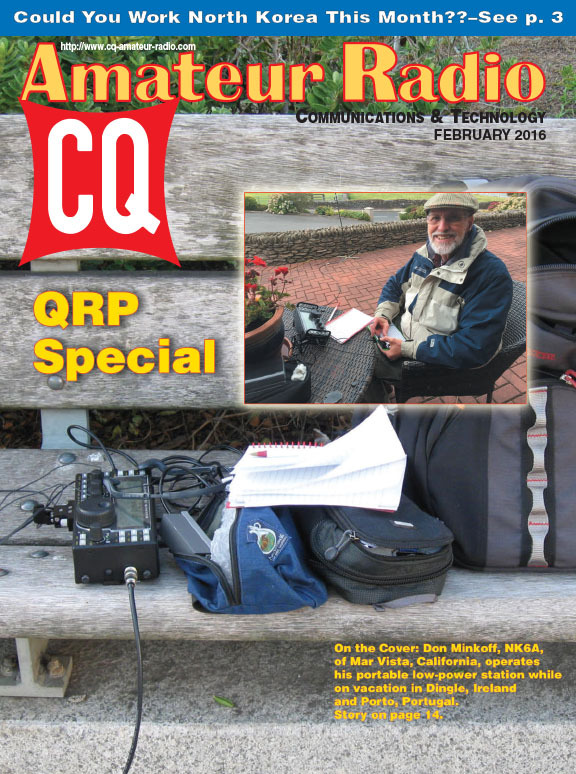 We start out with "My QRP Life," by AA4GP, who used to subscribe to that saying but was forced by circumstances into operating low power … and found that he's having as much fun as ever. 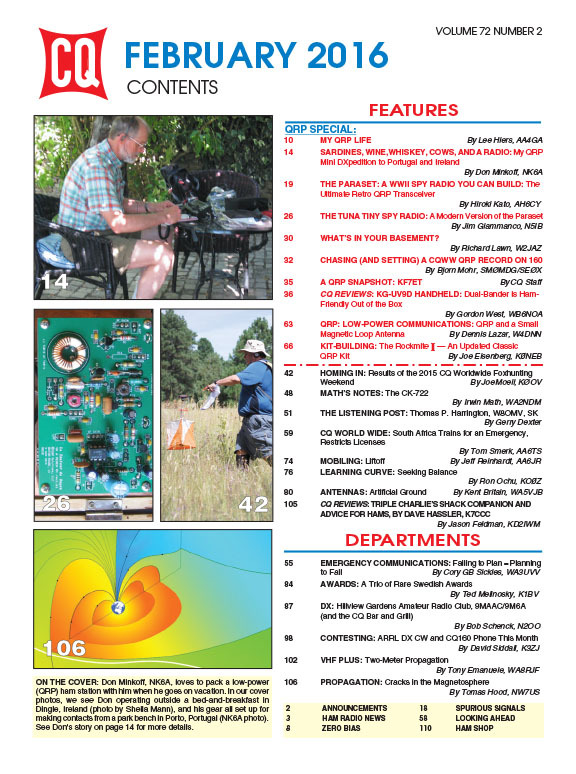 NK6A, who graces this month's cover, takes his portable QRP station with him on vacation, even on overseas trips, and gets on the air from some pretty interesting places, as suggested by his article's title, "Sardines, Wine, Whiskey, Cows, and a Radio." Next, we tie together vintage radio, building and QRP with a pair of related projects -- AH6CY writes about building a faithful replica of the World War II "paraset" spy radio, while N5IB offers plans for building a 21st-century version of the same radio. Speaking of contests, we also have the results of the 2015 CQ World Wide Foxhunting Weekend, We also review the new Wouxun KG-UV9D dual-band handheld. 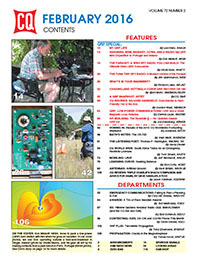 You can never have too much information on either antennas or propagation, and this month's issue of CQ takes a look at small magnetic loop antennas (in the QRP column) as well as artificial grounds (in the Antennas column); and at 2-meter propagation (in VHF-Plus) and "cracks in the magnetosphere" (in Propagation). Plus, we report on 3Z9DX's surprise operation in December from North Korea and his plans to be back on the air from there in February. 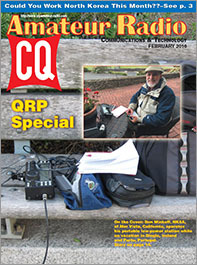 That's a brief look at what's coming up in the February issue of CQ. For information on becoming a CQ subscriber, click here. Zero Bias –"How Old Are You?"